Are you among the people who have gathered a bunch of books that are all worth reading but you simply haven’t found the time to deal with them? How many new people have you got to know today? Since most of us don’t meet a lot of new people every day it leaves us with reading. There is probably a lot of books you have read during your life but I can guarantee that there are even more that you haven’t. I took a look at the books I had beside my bed and came to the conclusion that I have completely read just a few of them versus most I have only read bits and pieces or even nothing. From now on I am going to spend 30 minutes to 1 hour reading every day. An average person reads about 30 pages per hour. Reading for 1 hour every day for a single year means that you would read 10 950 pages. The average book being about 200 pages makes it almost 55 books a year. Will reading 55 books on your specialty give you an edge? What do you think – if you were to read 55 books in any given field would it give you a small edge against all the people who are not doing any reading? Just to get the facts straight – 95% of the people in the world are not regular readers (That probably covers most of your colleagues as well). Well, that’s why as of today I am reading at least 30 minutes every single day. 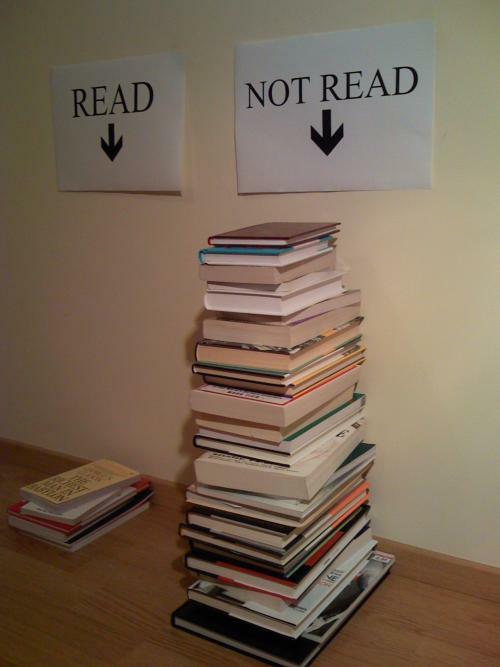 I suggest everyone do the same – divide your books into 2 piles (read and not read) and start reading! As you keep up with your reading schedule the pile with unread books will decrease and the one with read books will start to grow! You have a point here – if you just read a bit every day it will eventually make a difference! The hard thing is starting a new habit. Another bonus is that it keeps your home nicely uncluttered. It’s a good idea Raul – I have way too much books at home… They are taking up space that I would ideally like to see empty! I have recently made a promise to myself – I won’t buy new books before reading some of the one’s I already have. So hopefully the pile of unread books won’t grow! I agree about the bookshelves – I’ve been trying to find some that I like but being into minimalism I haven’t found any that suite my needs! Great idea! Just got to find room for the stacks! There’s no doubt that leaders are readers. So many stop educating themselves after their “formal education” is over and in the process they stop growing. Next post: Who Will Win?